The R.E.W.A.R.D. 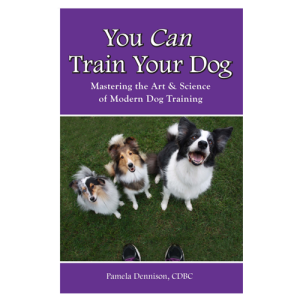 Zone for aggressive and reactive dogs DVD by Pam Dennison, CDBC! NOMINATED FOR BEST TRAINING DVD FROM THE DWAA! Author of How to Right a Dog Gone Wrong and Bringing Light to Shadow. The R.E.W.A.R.D. 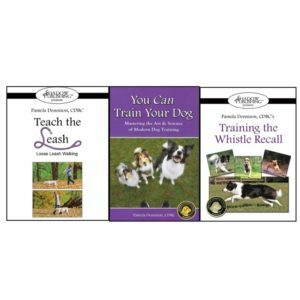 Zone program focuses on establishing foundation behaviors, learning to shape new behaviors, reading your dog, learning to interpret your environment and teaching owners to be better trainers. This DVD set accomplishes that by bridging the gap between information presented in my books and knowing how to transfer that to real life. What you’ll find in this DVD – real people, real dogs, real issues. You’ll see BIG concepts explained in an easy to understand and implement format. You’ll learn how to set up your own sessions and what foundation behaviors you’ll need. How and when to start a session, when to keep going and when to stop are also addressed. What you won’t find – car wrecks, wildly aggressing dogs, blood or drama. The R.E.W.A.R.D. Zone is about building a strong positive relationship, trust, safety and care, dozens of alternate and incompatible behaviors – incompatible to aggressing. 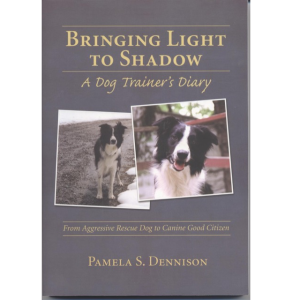 Review from Pat Miller, Peaceable Paws, MD: “Pam Dennison’s R.E.W.A.R.D. Zone for modifying reactive/aggressive dog behavior brings a fresh, new and exciting approach to a training world dominated by C.A.T., B.A.T., L.A.T. and counter conditioning methods. By helping the dog become enthusiastically engaged in a variety of training games and exercises and generously reinforcing behaviors that are incompatible with reactivity and aggression, the R.E.W.A.R.D. Zone process creates a positive association with the training environment. This happy association generalizes with the careful introduction of the stimuli that the dog was previously reacting to. The dog becomes so attentive to his handler and so engaged in the training activities that the other dog, human, or whatever, essentially becomes an irrelevant non-issue. The counter conditioning/desensitization process is almost incidental to the operant training exercises, and seems to occur more quickly, and without the dreary drudgery that can be part of a straight counter conditioning program. I’m already contemplating how to add some of these very effective attention exercises into our own Reactive Rover workshops… The information that Pam is offering is valuable, and deserves to be fully heard…. by the time I got to the end of the second disc I was sold. The sessions were very informative for people trying to understand the complexity of helping dogs with arousal/aggression issues. The thing I found helpful is the emphasis you put on evaluating the handler/dog teams as to the behaviors the dogs responded to, and the way you explained the degree that these “foundation behaviors” played in the outcome of the retraining process. In addition, the way you ended the sessions with the teams getting something useful accomplished, but didn’t try and give the teams too much to work on was also refreshing. The methodical approach you used is right in line with how I have learned to coach people to train their animals in a successful way. It’s a good product that can surely benefit those trainers in the industry starting out with more complex behavior cases and has some good pointers for even the more experienced ones too. Review: As I watch the R.E.W.A.R.D. Zone DVD, I’m thinking about everything I’ve studied and practiced. I’ve taken the instructor’s course in BAT. I’ve studied and used CU with every dog I work with. I’m a graduate of the Counseling Program through Jean Donaldson’s Academy. I’ve seen and participated in many of the “growly or feisty” classes. I’ve read the books and taken the 8-week course with Dr. Friedman. I am a student and I’m a trainer. I don’t write books, and I don’t blog. 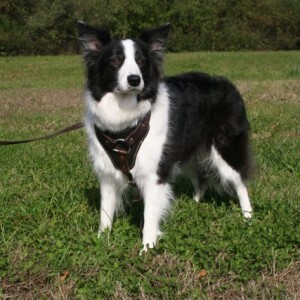 I work with reactive and non-reactive pet dogs and I teach people the skills needed to work with their own dogs. The R.E.W.A.R.D. Zone compliments everything I try to do with my students; one package that incorporates everything I’ve learned and done, and then some. Review: “I am so thankful that I bought your DVD. There has never been a reactive dog DVD filled with so much Fun for dogs to engage in. Pam, the methods that you share in your dvd will truly make a difference in the lives of dogs everywhere. Parents can now hold the key to Disneyland (making real life training fun) by using your methods which will in turn make any reactive dog care less while in the presence of other dogs.” Ron B. Review: Very worthwhile! Here is a chance to look over the shoulder of a superb trainer. Pam shows a variety of dogs with reactivity issues and works with each team in slightly different ways (at least in the video) so we get to view many skills being taught. I especially liked the written comments shown on-screen during the presentations. Many of them mirrored my own thoughts while watching. Every handler or trainer who watches this will walk away with some new ideas for handling reactivity. Review: I finally got around to watching the REWARD Zone DVD that I got for Christmas. I know time flies BUT Pamela Dennison did it again!!! This is the BEST DVD on dog reactivity- beh. modification. It was amazing to view each dog and handler team, and seeing what Pam did with each one. It really drove home the importance of foundation behaviors – WOW. I love how she asked each team, before they got started to “show me what you got.” I am just so geeked over this DVD!!! The shaping exercise done with the reactive dogs and the decoy dog in the room was amazing to see, along with increasing/decreasing distance, changing criteria, parallel walking, etc… I just loved how Pam critiqued each team – I was taking notes- such great information she said with each team. I am so happy this is on my bookshelf and it should be on every trainer’s shelf too, if you are working with reactive, aggressive dogs, BUY IT. AWESOME – Great job! Additional S&H charges may apply and will be calculated during the payment process.